Navigate to the People Page. Select the team members you want to send login details to by checking the box next to the individuals name. If you wish to select all of your employees, you can check the box on the top left of the page next to the 'Name' column. Press 'Send Welcome Email' and your team will receive a Welcome Email introducing them to Rotageek and allowing them to set their passwords. If you cannot see all of your employees this is most likely because you have a filter on. 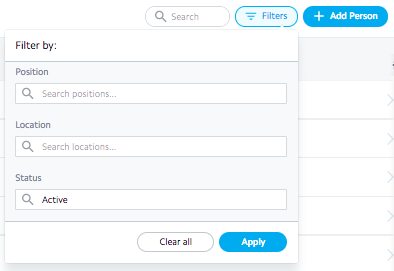 To check, click the 'Filter' button on the top row and edit as necessary. 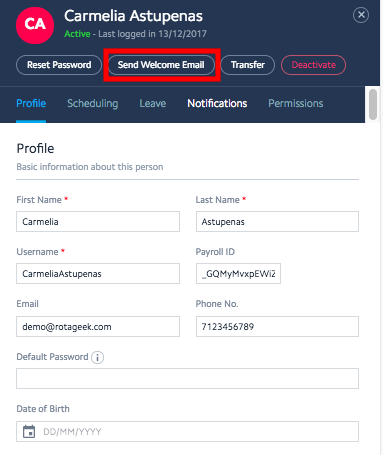 If you wish to send login details to a single employee select that individual from the People Page, open their profile and click 'Send Welcome Email', as highlighted below.